“Back to Batoche” is an annual celebration held the third Thursday to Sunday in July in Batoche, Sask. It attracts thousands of visitors from across the Métis Nation Homeland and beyond who gather at Batoche to visit, celebrate their heritage and honour those Métis who died during the 1885 Northwest Resistance. This event is the modern version of the old Métis holiday, St. Joseph’s Day (July 24), which was first named as a Métis national day in 1884. The historical St. Joseph’s Day, the celebration honouring the patron saint of the Métis, involved a mass and a country fair with music and dancing. Men participated in horse racing, shooting and arm-wrestling contests, while women displayed their embroidery, quilting, rug hooking, sash weaving, beadwork and crocheting. St. Joseph’s Day was celebrated at Batoche until the 1930s. On June 26-28, 1971, the modern Back to Batoche celebration was inaugurated. Costing $30,000, the gathering was actually a Métis Society of Saskatchewan convention, with July 25 being set aside as a “camping day.” The Canadian Army supplied tents and ration kits, and policing was provided by “special Native police” and the Rosthern RCMP. The event was labelled as a political and cultural “rebirth” of the Métis Nation and included powwow dancing, racing, sports events, turkey shoots, bannock baking, tent pitching, fiddling and Métis dancing contests. During the 1972 gathering, over 12,000 people attended, and they enjoyed watching and participating in a beauty contest, Métis dancing, a powwow, a greased pole event, a greased pig chase, bannock baking, jigging, fiddling, tent pitching, hand games, canoe racing, ball tournaments, bingos and saddle horse racing. In 1977, there was no gathering at Batoche because the Association of Métis and Non-Status Indians of Saskatchewan and the government could not agree to a funding arrangement. In 1978, 7,000 people attended Back to Batoche, which demonstrated that government interference couldn’t dampen the Métis’ and non-status Indians’ spirit and resolve to fight for their rights. While the original purpose and some of the activities have changed over the years, coming together to celebrate the Métis’ vibrant culture and rich history has always been consistent. 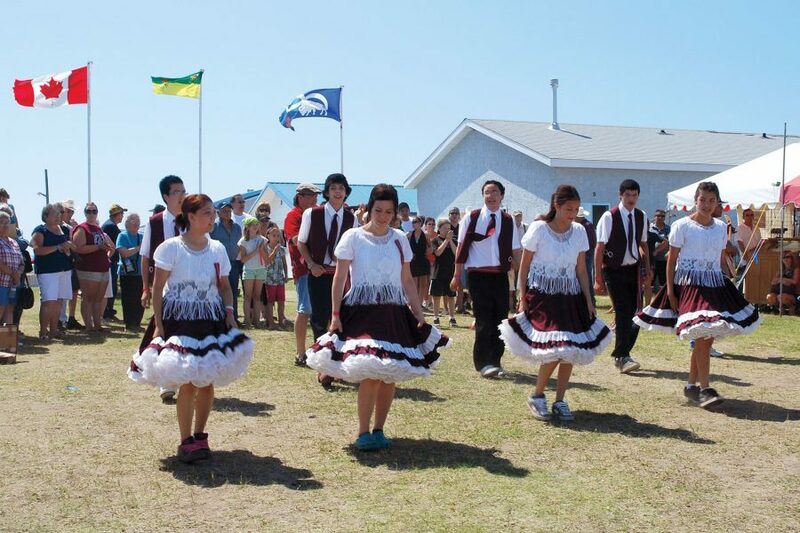 Dancers at the annual Back to Batoche celebration. While Christmas was a religious event for the Métis, New Year’s was a grand social celebration. It was not uncommon for several households in a community to hold a feast and dance on different nights so that people could visit and celebrate for many evenings in succession around New Year’s Day. In the 1860s at Prairie-Ronde, in what is now the area around Dundurn, Sask., a New Year’s celebration lasted 10 days! Manitoba Métis Elder Joe Venne had this to say about the Métis’ festive spirit during the holiday season: “When it came to the holidays, Christmas and New Year’s, we used to go for two, three weeks at a time, dancing every night, partying every night. Other people didn’t have that style.” Depending on the community, some households would take turns holding a feast and dancing, allowing people to visit a different house each night. On Christmas Eve, we went to midnight mass, and when we got home, we ate a little, drank some tea and went to bed. Children were an integral part of New Year’s celebrations. On New Year’s Eve, children received presents from their parents, usually small gifts of food. One Elder related that “on New Year’s Eve, children hung stockings at the foot of their bed and would wake up to find all sorts of treats.” After receiving their presents on the morning of New Year’s Day, children thanked and blessed their parents, and families hugged and kissed one another. Fathers also blessed their children on this day. New Year’s Day was usually held at the grandparents’ home and was a special time for families, as cousins, aunts and uncles attended. It was an occasion for social drinking, and the eating of all sorts of food, with people travelling from house to house, dining, dancing and visiting. While visiting house-to-house, everybody would shake hands and kiss. As a result, some Métis called New Year’s Day “Ochetookeskaw” (kissing day) or “Shakishchenoisi” (shaking hands day).